Computer Network Architecture is defined as the physical and logical design of the software, hardware, protocols, and media of the transmission of data. Simply we can say that how computers are organized and how tasks are allocated to the computer. 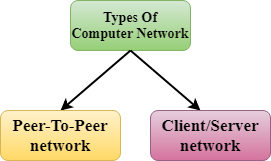 Peer-To-Peer network is a network in which all the computers are linked together with equal privilege and responsibilities for processing the data. 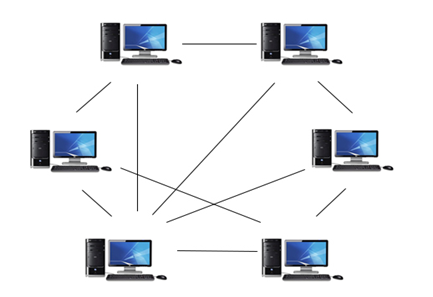 Peer-To-Peer network is useful for small environments, usually up to 10 computers. Peer-To-Peer network has no dedicated server. Special permissions are assigned to each computer for sharing the resources, but this can lead to a problem if the computer with the resource is down. It is less costly as it does not contain any dedicated server. If one computer stops working but, other computers will not stop working. It is easy to set up and maintain as each computer manages itself. In the case of Peer-To-Peer network, it does not contain the centralized system . Therefore, it cannot back up the data as the data is different in different locations. It has a security issue as the device is managed itself. Client/Server network is a network model designed for the end users called clients, to access the resources such as songs, video, etc. from a central computer known as Server. The central controller is known as a server while all other computers in the network are called clients. A server performs all the major operations such as security and network management. A server is responsible for managing all the resources such as files, directories, printer, etc. All the clients communicate with each other through a server. For example, if client1 wants to send some data to client 2, then it first sends the request to the server for the permission. The server sends the response to the client 1 to initiate its communication with the client 2. 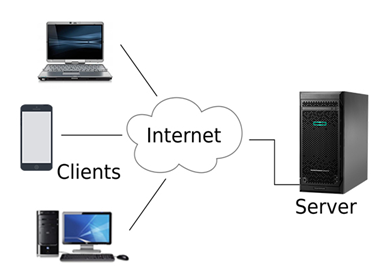 A Client/Server network contains the centralized system. Therefore we can back up the data easily. A Client/Server network has a dedicated server that improves the overall performance of the whole system. Security is better in Client/Server network as a single server administers the shared resources. It also increases the speed of the sharing resources. Client/Server network is expensive as it requires the server with large memory. A server has a Network Operating System(NOS) to provide the resources to the clients, but the cost of NOS is very high. It requires a dedicated network administrator to manage all the resources.